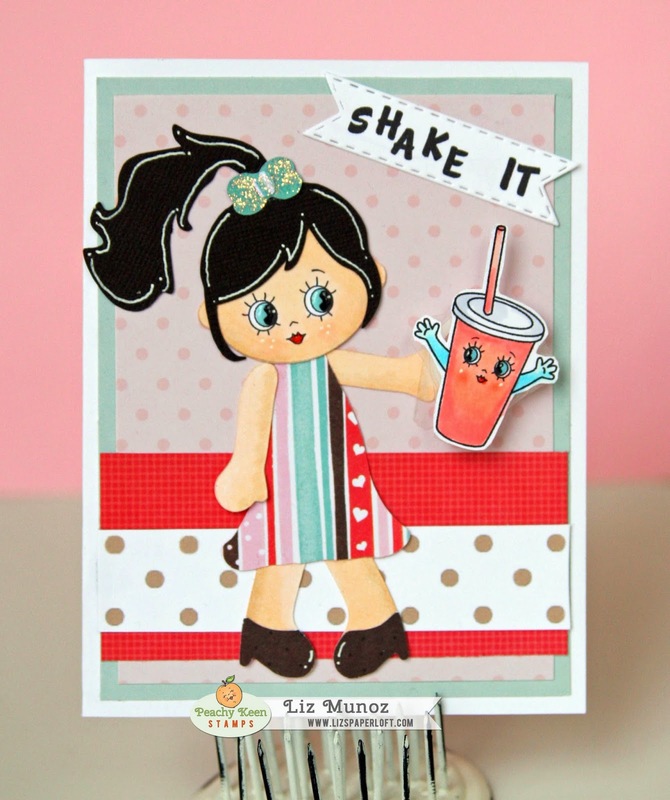 Liz's Paper Loft: PKS April Release Sneak Peek Day 3 ~ Shake It! Hello, welcome to day 3 of Peachy Keen Stamp April Release Sneak Peek! Haven't you loved what's been sneaked by all the girls so far, I know I have! Oh and those eyes! I just LOVE those eyes!!!! I used the die cut girl for KaDoodle Bug, and just made a few alterations to her. I just realized that I forgot to add her jewelry :/ now it's too late to do it. I had planned to add a rhinestone necklace and earrings. These will be added before I give it to someone, however for now you'll just have to imagine that it looks soooo cute! lol! Now, it wouldn’t be a Peachy Keen Stamps event if we didn’t offer you a chance to win a prize, and no way would we break from that tradition, so here’s what you can do to get a chance to win the stamp sets we’re sneak peeking tonight. Just leave a comment! It’s as easy as that, but remember that leaving comments on The Peachy Keen Stamps Blog AND on our designer’s blogs gets you even more chances to win!! Somebody’s going to be a VERY happy stamper!! 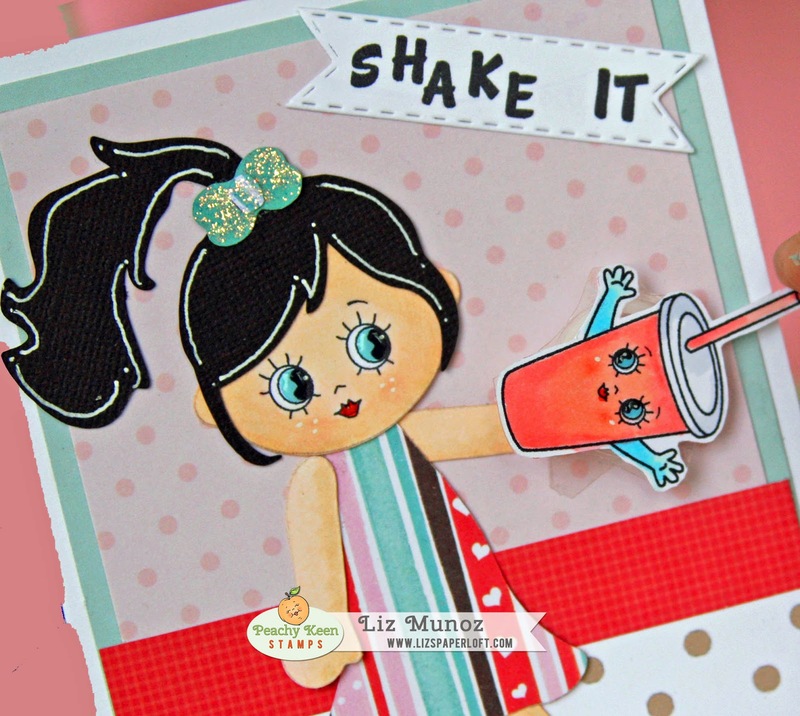 Wow, I am loving today's sneaks your card is beautiful, I love the face stamp, thanks for sharing!! Your card is so adorable! I love the little face on the cup! These are so cute. The 50s is my era - love to revisit that time. whole lotta shaking going on! This is seriously TOO darn cute!!! I love that you added action wobble..Super DUPER cute!! So cute and perfect for a wobble! So cute! Love this face and I can't wait to add them to my collection. Adorable card Liz. Love the ponytail and the action wobble. So cute. Oh My Goodness… Love these eyes. Reminds me of Betty Boop eyes. I totally want this set!!! Loving this sneak peak. Great card. 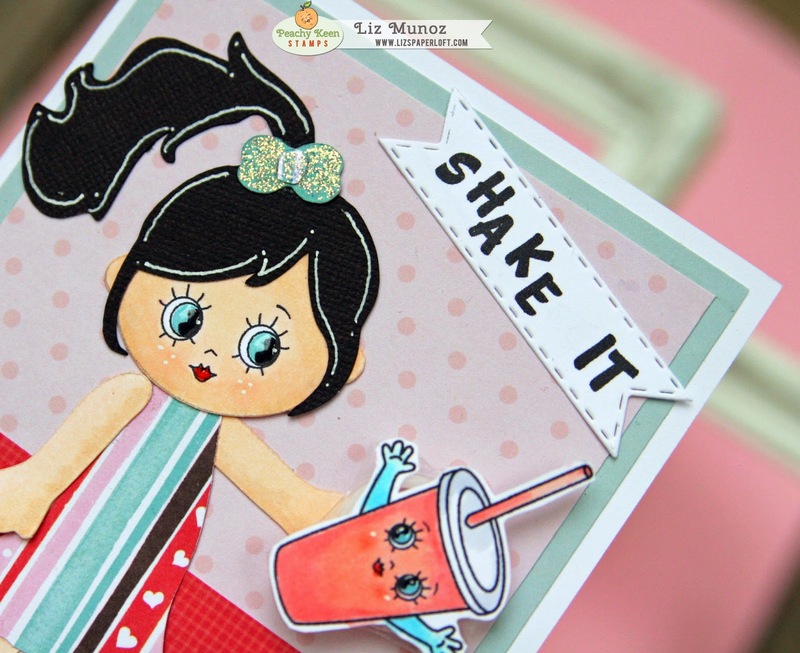 such an adorable card and those eyes remind me of betty boop or those cupid babies.great job!! Wow, its a cool card with great coloring and color combo. The face brings her to life. Liz ~ Oh this is too CUTE too! How did you get her shake to fall?? CLEVER! Well I LOVE the eyes too~ ADORBS!!! LOVE this release! Oh she doesn't need jewelry ~ she is PERFECT just the way she is! Great card. Love her eyes! She looks great even without her jewelry! Cute. Cute. Cute! Thanks for sharing this sweet card. I can just imagine the extra bling to come. So cute....I love this era because I grew up in it. The DT did a supper job on all the cards. Good Luck to everyone. Super cute! I love the wobble you added to it! Awesome idea! Love how it moves!! Very cute design and wonderful colors! I love that your card has an action wobble on it. The cup moving is too cute. Too cute and the wobble on it makes it take the cake! LOVE the eyes on her too!!! Soooooo CUTE! Even without the jewelry... thanks for the inspiration. Eeeeekkkk!!!! Mis Liz, this is way too cute!!! Her dress is adorable! OMGosh, how in the world did you get a wobble on the back of that milkshake?! Does Theresa offer them in smaller sizes now??? I've been hoping so, because there's lots of things I want to make wobble, but sometimes the action wobble is just too large for what I want to shake. So this is like genius, obviously--shake it!! :D LOVE! Thanks for always inspiring me! Adorable! I love the new peachy faces, a must have for sure:)lol. Loved the wobble, are they making them in tiny version now, cus I could sure use some in that size:) Thanks for the inspiration and for sharing.